The BJP government in Gujarat on Thursday defended the decision to suspend two Congress MLAs for three years and one other for one year from the House on March 14, saying that the membership of the three MLAs could have been terminated. 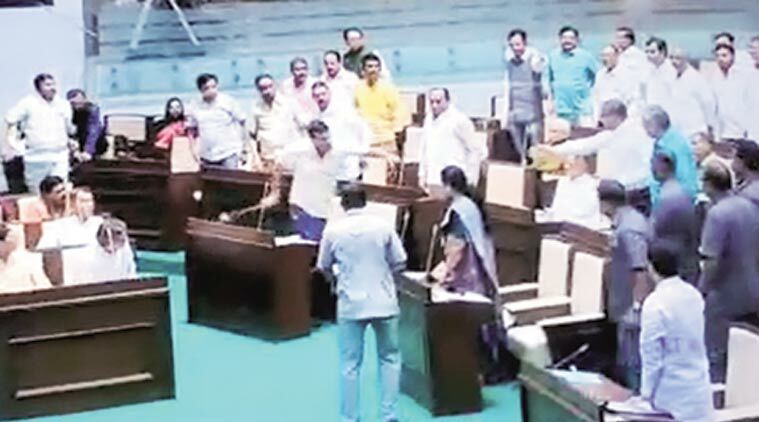 On March 14, two Congress MLAs — Amrish Der (Rajula) and Pratap Dudhat (Savarkundla) — were suspended for three years and one MLA — Baldevji Thakor (Kalol) — was suspended for one year following a fracas on the floor of the Assembly. “The scenes created in the Gujarat Assembly have been seen by all. The state government is committed to maintain highest traditions of parliamentary democracy and to ensure that nobody dares to make such misbehaviour in future. The two MLAs suspended for three years and one MLA suspended for one year have been suspended as per the rights of the House,” the statement said. Gehlot is at present Congress party in-harge of Gujarat. The two ministers then cited other “precedents” of states like Madhya Pradesh, Maharashtra and Andhra Pradesh. According to them, two members of Madhya Pradesh Assembly were terminated from the House and the decision was upheld by the concerned High Court. “In Maharashtra, MLAs were suspended for four years in 1964 and 2009. In Andhra Pradesh also, the Assembly had suspended one of its members for one year in 2015,” the release stated. “The government is concerned about what happened in the House and what followed it and is ready for discussion inside or outside of the House… Looking at the entire turn of events, the three MLAs could have faced maximum punishment of termination of their membership. However, the proposal of suspension was moved following serious considerations,” the two ministers said. “It is an inbuilt right of the House to punish its members for their behaviour. The House has right to frame rules for its functioning however, the House is not answerable to any outside authority to follow those rules and it can act differently from those rules as per its discretion,” they added. The two minister’s statement was released hours after Congress leader Shailesh Parmar told mediapersons suggesting that his party was willing to withdraw the no-confidence motion against Speaker Rajendra Trivedi if the the government reduced the suspension of its three MLAs up to the current session. The Congress has moved the motion to remove the Speaker accusing him of being biased against the party MLAs.